So i’ll admit, my glazed salmon was a flop, i tried this recipe that was making an asian glaze with soy sauce and Szechuan, it was such a waste of trying to make my own glaze! 5 minutes into cooking the salmon the glaze around it that got onto the pan it was cooking in started BURNING in the pan and stunk up a storm. I had to switch pans and continue broiling the fish, and i was just completely unimpressed with the glaze anyway because it came out making the fish taste fishier – not my thing. I prefer a lemon sauce with light seasoning on my grilled or boiled salmon. 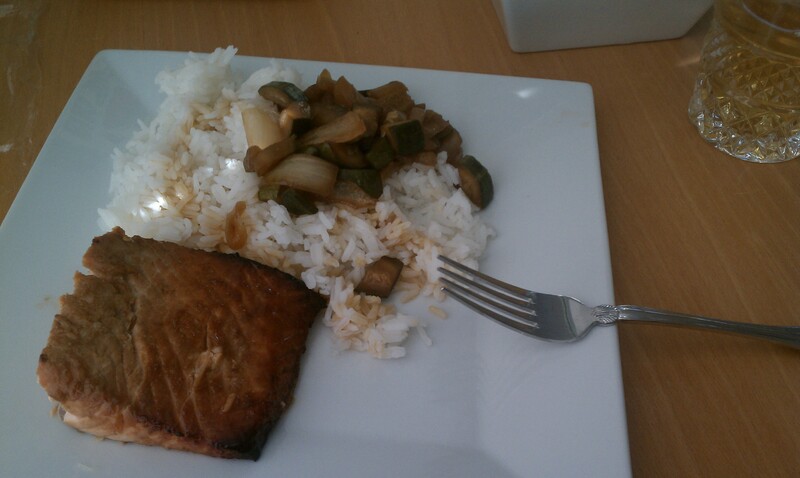 Anyway, I really liked the jasmine rice but my favorite were the slow cooked veggies. I literally just had this craving for soft zucchini and so i chopped up some zucchini and onion, put it into a slow-cooker and let it do its thing for like 5 hours. This recipe calls for you to make your own judgement on how much sauce to use. It depends on how many veggies you’re using. I didn’t drench them, i poured a small amount in and let it mix with the juices of the veggies. I didn’t have any toasted sesame seeds but next time i will – and it will be better. Throw the veggies in and add all of the sauce, along with the pepper. Let it cook in there for a while, and bam – great, soft veggies. You can also do this on a skillet over warmed up oil and toss the veggies around over low heat with the sauce mixture.